You save $14.28 on quantity of 6 bulbs over �each� price on this variety. Spicy fragrance, 3 to 4 Feet. July / Early August flowering. These candy pink color blooms have light speckles, fine white edges, and a sweet fragrance, all rolled into one! 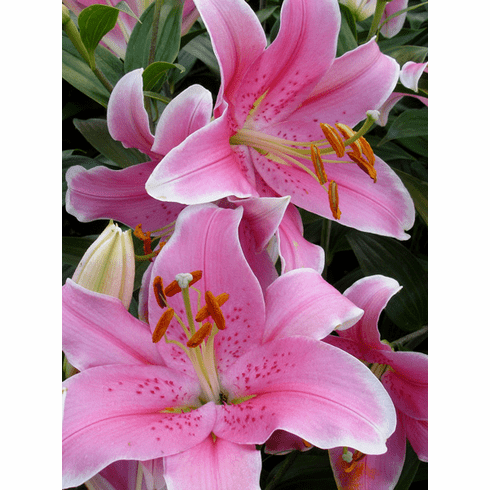 Not many pink Oriental Hybrid lilies exhibit such clear, pure color. Great when combined with icy-pink or whites. We do advise customers in the extremely warm areas to give all of their pink varieties a bit of afternoon shade. We have received though a number of reports about how well 'Sorbonne' holds up even in those areas. 3 to 4 Feet. Late July / Early August Flowering. Fragrant.